One of America's most nationally renowned public school teachers, Jaime A. Escalante is a Latin-American immigrant who arrived in the U.S. at 32 without knowledge of English. After spending several years in menial jobs while learning English, he began a professional career and eventually became a high school math teacher at Garfield H.S. in Latino East LA. There, he began an extraordinarily successful Calculus Advanced Placement course, proving that large numbers of Latino kids from immigrant and working-class backgrounds could perform college-level mathematics while in high school. These achievements were chronicled in the 1987 Edward James Olmos film Stand and Deliver, which brought him international recognition. While at Garfield H.S., he had successfully worked to eliminate the school's "bilingual education" programs, which he believed handicapped Latino students. In October 1997, he agreed to join the "English for the Children" campaign as Honorary Chairman. 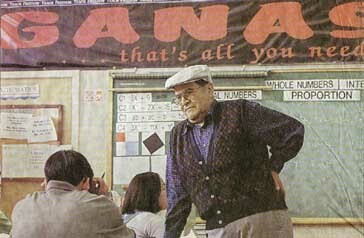 English for the Children, October 10, 1997. Los Angeles Times, November 13, 1997, p.3.